On Saturday, January 13, Aid Our Veterans is holding a Bull Roast fundraiser at the American Legion Post 148 in Essex. Aid Our Veterans is a 501(c) 3 non-profit organization working to help homeless and out of work veterans with programs and services such as housing and job training and placement. The Bull Roast will feature music, door prizes, 50/50s, silent auctions, wheels of chance, lay downs, games and more. The menu includes pit beef, ham and turkey, beef barbecue, chicken, mashed potatoes and gravy, baked beans, string beans, baked mac and cheese, salads, a variety of desserts, draft beer, soda, coffee and hot tea. A cash bar will be available for mixed drinks. Door prizes, baskets and raffles will include baskets of cheer; a flat screen television; a tailgating package; vacation packages; and lots of family fun night packages. Lupton’s Sports Collectibles will be running a silent auction with sports memorabilia. Special guest of the evening will be Santa Claus, who is currently vacationing but will make this last appearance before heading back to the North Pole. 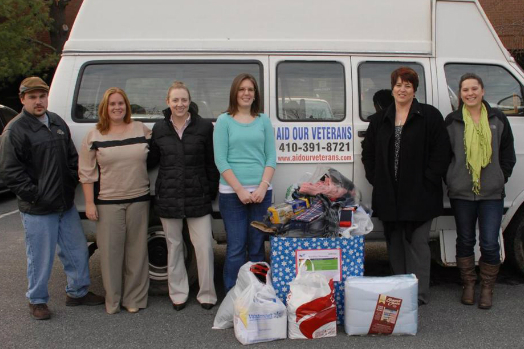 Aid Our Veterans was founded in 2008 by Thomas Conlan, a US Navy veteran, in response to the many needs he had witnessed among fellow military veterans. Conlan was concerned by the ever-growing population of homeless and jobless veterans, many of them suffering from war-related injuries and mental health issues. Having enjoyed a successful career in the construction field after his service, Conlan felt he needed to give back, so he started Aid Our Veterans. When Conlan passed away in 2013, Smith was named the director. Veterans can call the organization directly to ask for assistance, but many veterans are referred to them by other organizations such as the VA.
“Many of the veterans are homeless, and are looking to get into shelters. But some don’t want to get off the streets for whatever reason, so we try to find them a cheap motel, or they may want tents and sleeping bags,” she said. Other veterans who are not homeless might be down on their luck because of medical bills. Some are working, but they can’t catch up with their bills after being out of work for a long period. For tickets or more information, call (410) 391-8721 or go to http://aidourveterans.net.